The forest products industry contributes to each Parish economy in a number of ways ranging from jobs, wages, and purchases in local economies to local, state and federal taxes. Additionally, the purchase of goods and services by the forest products industry and its employees spurs economic activity in other sectors of the economy resulting in a substantial cumulative economic contribution. 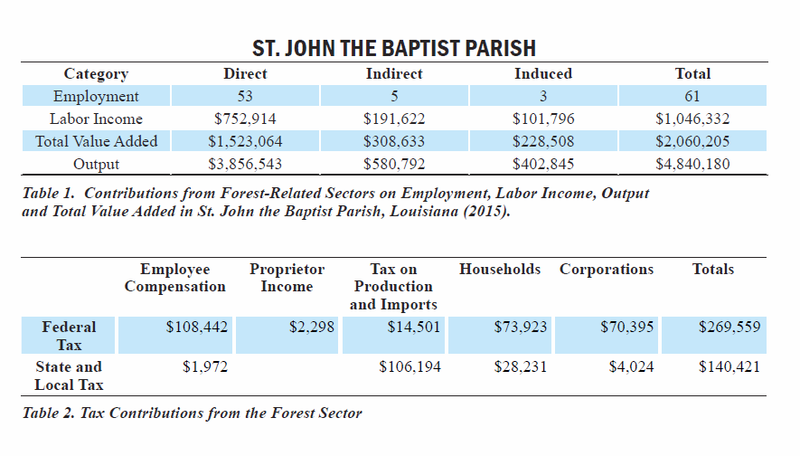 The forestry and forest products industry in St. John the Baptist Parish, Louisiana, had a total economic contribution amounting to approximately 61 jobs and $1,046,332 in income during 2015. Forestry and the forest products industry generated an output of $4,840,180 in this parish. Total industry output is defined as the value of all goods and services produced in the parish. Value added amounted to approximately $2,060,205. Value added represents the creation of new wealth and is inserted into the economy through payments made to workers, interest, profits and indirect business taxes.